Choose GLM Group for IBM InfoPrint continuous form laser printers. These pin feed laser printers are available refurbished only, subject to availability. Service, support and maintenance options available. Ask us about available new replacements from other manufacturers. These printers are often installed with roll-feed input and roll-to-sheet post-print equipment. Also available to print as box-fed. The InfoPrint 75 and InfoPrint 100 are often found in label printing operations. Media must be pre-tested by Ricoh RPPS prior to acceptance for Ricoh maintenance. Users are often subject to additional fuser replacement costs due to label printing characteristics. IBM was a pioneer in business laser printing beginning in the 1970s with the IBM 3800. Back in 2007, IBM released the details of the sale of the IBM Printing Systems Division to Ricoh. This action created the InfoPrint Solutions Company, a joint venture for the next three years. In the previous five years, IBM had acquired 60 companies with an emphasis on software and services. Also, IBM had sold off the businesses of hard disk drives, displays, and the IBM PC business. As a stockholder, one could wish that the next decade would witness great strategic growth. As stated, one could wish. IBM and Ricoh had enjoyed a long relationship as Seller/OEM of the continuous form lasers. Ricoh had acquired Hitachi’s high-speed printing group, the supplier to IBM Printing. Ricoh found it strategic to own the vertical of build/sell/maintain/control. ‘Production Printers’ is how IBM identified the continuous forms lasers in the product line. 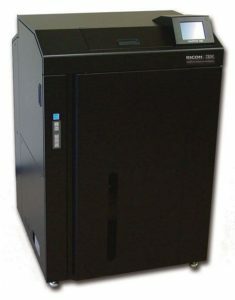 The InfoPrint ‘cut-sheet printers’ were versions of Ricoh copiers. Per the Ricoh website, all Ricoh now sells is CF inkjet. Ricoh has withdrawn all InfoPrint CF laser printers. They are only offered as refurbished, and as available in the marketplace. Please contact us regarding your specific requirements.